We deal in Biomass Waste Wood. 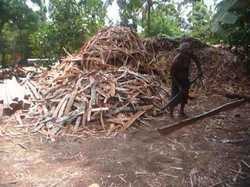 We are Havinig Coconut Wood waste in bulk volume. Wood waste gets when cut the coconut tree in the saw mill. Being a well-renowned entity, we are engaged in providing a distinguished range of Veneer Waste. It is double time of calorific value compare with Neyveli Lignite (5040 Kcal/Kg). It is best opted fuel for industries like paper, food processing, textiles industrial boilers, Hotels and especially for BIO – MASS plants. It is highly demandable and flammable fuel.